Ordinary Struggles courtesy of Tricycle Magazine where it first appeared in Volume 15, Number 4, is an interview of Rev. Koshin Ogui, former Socho (Bishop) of the Buddhist Churches of America, by Tricycle contributing editor Clark Strand on the topic of practice in the Pure Land Buddhist tradition. What follows is the text of an essay entitled “A Brief Introduction to Jodo Shinshu” by Kenryu T. Tsuji. Jodo Shin Shu literally meaning “True Pure Land Religion” was founded by Shinran Shonin. In America, it is often called Shin Buddhism. The accepted date of the founding of this denomination is 1224, when the first draft of Shinran’s most important book “Teaching, Practice, Faith, and Attainment” (Kyo Gyo Shin Sho) was completed. Shinran Shonin was born on May 21, 1173 (First day of the fourth month, and third year of Shoan) in the village of Hino on the outskirts of Kyoto. When he was four years old he lost his father and later at the age of nine he lost his mother. Thus, orphaned at an early age he entered the priesthood on Mount Hiei, which was then the center of Buddhist learning. Here he was to stay for twenty years, practicing the most arduous of physical and mental disciplines. The principal teaching of the monasteries emphasized the purification of the self for the attainment of Enlightenment. Never did a young priest apply himself so wholeheartedly to all the disciplines. He soon became renowned for his scholarship and could easily have become head of one of the larger monasteries, but he was neither interested in position nor in the pursuit of knowledge. His main concern was Enlightenment. After two decades on Mount Hiei, Shinran Shonin came to the sober realization that Enlightenment was impossible for the common man. The disciplines of Mount Hiei made him acutely conscious of his own human weakness. His life was finite; his knowledge incomplete and his capacity for perfect goodness limited. Upon meditation he discovered that in all his activities he was essentially motivated by the three poisons of greed, anger, and ignorance. In this state of mental anguish, Shinran Shonin renounced the life on Mount Hiei. His descent from this mountain was the turning point in his religious pursuit. Shortly thereafter, he met a kindly priest, Honen, who taught a simple faith in Amida Buddha and the recitation of the Nembutsu as the way of religious fulfillment. Honen Shonin brought Shinran face to face with Amida’s infinite Wisdom and Compassion. For the first time in his life Shinran found inner peace in the faith that Amida Buddha was primarily concerned with such a person as he. The Buddhist life he realized could be lived by the man in the street without confinement in a monastery. The gate to life’s meaning was now open to all and thousands of people flocked to hear and accept the hopeful message of the Nembutsu. The powerful monastic orders, however, feared a weakening of their long established tradition and prestige and convinced the Imperial Court to banish Honen and Shinran, but the spiritual energy of the Nembutsu had been unleashed. The teaching soon gathered momentum as it spread from person to person and village to village. Especially, during his years in exile, Shinran personally met with countless persons to awaken their faith in Amida Buddha. Shinran finally settled in Inada and there completed the first draft of the “Teaching, Practice, Faith, and Attainment” in 1224. In 1232 when he was fifty-nine, he retired to Kyoto. During the intervening years until his death, he wrote many books which are read and studied even today. He died on january 16, 1263 (Twenty eight day of the eleventh month, of the second year of Kocho). Shinran Shonin never claimed that he was founding a new religion. He was merely stating the purpose of Sakyamuni’s advent on earth – which was to awaken mankind to the Wisdom and Compassion of Amida Buddha. After Sakyamuni’s Nirvana, seven patriarchs transmitted the heart of Amida Buddha over the centuries. They were Nagarjuna and Vasbandhu in India; Donran, Doshaku and Zendo in China and Genshin and Honen in Japan. 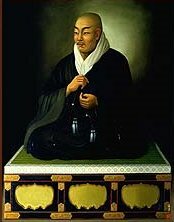 In the “Teaching, Practice, Faith, and Attainment” Shinran Shonin quoted from the writings of these patriarchs to support his faith in Amida Buddha. The Larger Sutra on the Eternal Life. In this sutra, Sakyamuni tells the Sangha about Amida Buddha. The Meditation Sutra on the Eternal Buddha. This sutra shows the actual case of a woman who finds salvation through Amida Buddha. The Smaller Sutra on Amida Buddha. This sutra describes the beauty of the Pure Land and extols the virtues of Amida Buddha. Trikaya, meaning three bodies, is not three separate bodies but three aspects of the one body of Buddhahood. Buddha as Dharmakaya (Body of Truth) resides in everything. The Dharmakaya is impersonal law, principle, ultimate reality – the Truth of the Universe. It is indescribable and inexpressible. The Buddha as Sambhogakaya (Accomodated Body) is personal and appears before our religious awareness as Amida Buddha of Wisdom and Compassion. Buddha as Nirmanakaya (Manifested Body) refers to the historical Buddha who appeared on earth as Sakyamuni 2500 years ago. In Jodo Shinshu, the object of worship is Amida Buddha. Amida is depicted artistically as an active Buddha in a standing position, hands held up in a gesture of bestowing blessings on all beings and leaning slightly forward – symbolizing the eternal activity of Wisdom and Compassion. The Primal Vow of Amida Buddha promises Universal Enlightenment for all beings. In all the religions of the world there is no vow that has such a sweeping power, promising hope and life’s fulfillment to human beings as well as all living things. The all compassionate activity of Amida Buddha will never cease so long as beings are lost, forlorn, suffering or wandering in a meaningless existence. When we truly hear the Name, Faith is awakened in our hearts. Hearing the Name is not merely hearing the sounds of “Namo Amida Butsu,” but hearing Amida Buddha with our whole being, calling to us throughout timeless time. Thus, when we hear Amida’s voice in our innermost being, faith is awakened. We now realize that this faith itself and even the power to awaken it is a gift from Amida Buddha. Faith competes our Oneness with Amida and is the true cause of our Enlightenment. The Awakening of faith naturally prompts a response from Amida Buddha. This is the Nembutsu of gratitude to Amida Buddha for salvation that is assured. Those who recite the Nembutsu in faith have attained the “ranks of the truly assured.” Such persons live the life of Nembutsu. Absolute Enlightenment is attained in the Pure Land after death when all finite, limited qualities of the physical being are extinct. While the human weaknesses of greed, anger and ignorance are still functioning the perfection of personality is an impossibility. Just as the waves of Wakano-Ura-Bay. The Pure Land ideal is the culmination of the teaching of Compassion and Wisdom. While the ultimate objective of life in Jodo Shinshu lies in the achievement of Buddhahood, life’s immediate purpose is realized in the awakening of faith. In this religious experience we know that we now live in Amida’s Light. This is the spiritual state Shinran Shonin called the “ranks of the truly assured.” The recitation of the Nembutsu – Namo Amida Butsu – flows naturally and clearly as waters from a mountain spring. The life of faith has achieved a high level of internal organization. It will have developed the wisdom and insight to understand the changing circumstances of life. Even under adverse conditions, a man of faith will be strong because his inner conviction is strong. He has gained a new vision and dimension in his life. Because his spiritual roots reach down into the Compassion of Amida Buddha, his “taste” of life is inexpressibly sensitive. His religious acts are performed out of gratitude to Amida Buddha. He asks nothing of Amida Buddha but dedicates his whole being to him. The following is a reflection on Jodo Shinshu by Rimban Don Castro in a 2004 message. Recently, I have been thinking about Jodo Shin Buddhism as a kind of “Protestant Buddhism.” This is not to say that we teach anything different from the doctrines adhered to by all Buddhists. I believe our differences from other Buddhists arise from our understanding of how we are able to relate to the fundamental teachings of Buddhism. For instance, rather than seeing ourself as one who is able to generate compassion we are recipients of boundless compassion. As Protestants we say, “Yes, I should be compassionate but…” “Yes, I should strive for enlightenment but I realize enlightenment is beyond my capability.” It is for people like myself that Amida Buddha extends his boundless wisdom and compassion which leads us to enlightenment. Thus, enlightenment is no longer an issue. In Jodo Shinshu, the crucial issue is receiving Amida’s vow power and expressing our gratitude. Our gratitude deepens as our understanding of the value of the gift increases. If we have been given assurance of birth in the Pure Land (nirvana), how profoundly grateful must we feel. An ever-deepening sense of gratitude seems to me the life process, the maturing process, of the sincere Shinshu follower.